Congratulations! You are on the verge of discovering your top 5 PASSIONS!! This is called a “Passion Test!" What a treat you are giving to yourself!! Did you know that only 20% of the population is passionate about what they do and live their lives on purpose? Let’s raise that to 100%! What would our world be like if everyone was living their passions? What do you love most? What makes your heart sing and matters most to you? To prepare for your 60 minute Discovery Session, finish this sentence with 10-20 statements beginning with an action word, like spending, thriving, experiencing, creating, living etc. 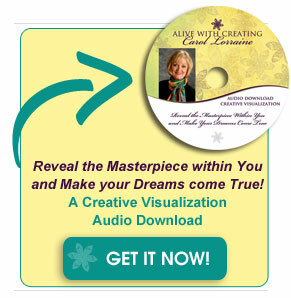 Then email this list to me at Carol@AlivewithCreating.com. We will schedule your Passion Test. Carol has helped me rekindle my passion for serving others with a long anticipated refocusing of my vision and commitment. I am feeling more balanced, organized, confident, and hopeful that our business can and will be successful and sustainable!